The Washington University School of Law approached Hartman-Cox to address expansion needs associated with their facility. The solution was twofold: to renovate and repurpose existing space within the building to meet changing office and classroom programmatic needs, and to infill the existing 5,000 square feet courtyard with a skylighted student commons. The overarching architectural intent for the courtyard enclosure was to create a year round space serving the Law School in a variety of capacities such as casual gatherings, lectures, presentations and social events. The courtyard canopy, with its thin and elegant structural grid, created a light-filled centralized space designed to maximize flexibility. 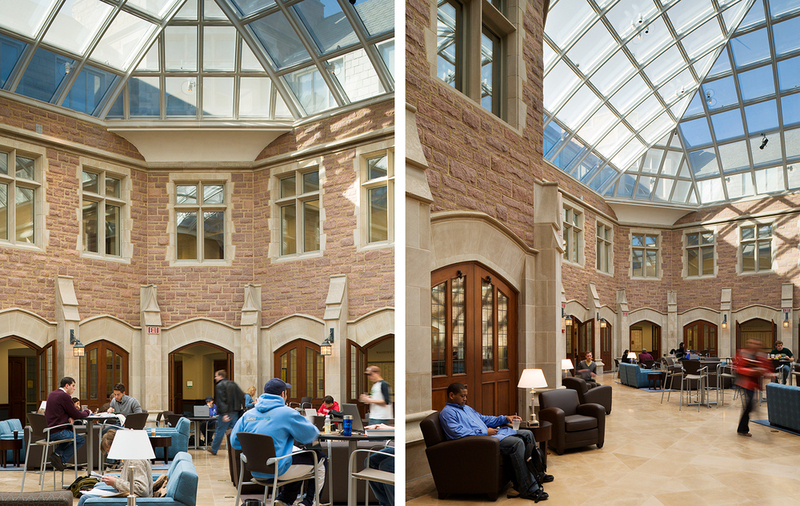 The enclosure not only transformed the courtyard into the heart of the building, but it also established the commons as one of the most desirable interior spaces on the entire campus.